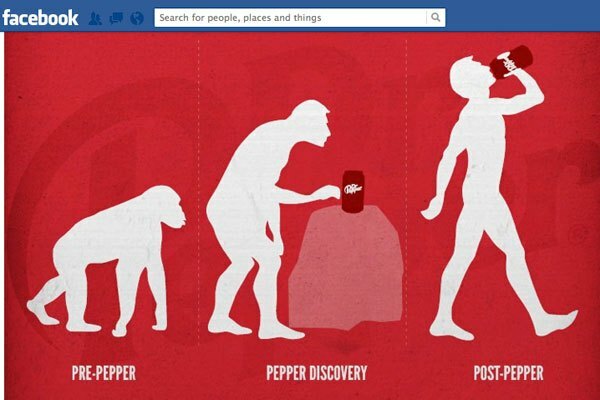 A recent Dr. Pepper Facebook ad, depicting the evolution of the soft drink along with the evolution of man, has some Christian groups outraged. On the tails of Chick-Fil-A’s similar, but very different, open stance against gay marriage, one has to wonder how corporate efforts to penetrate an ever-shrinking marketplace will continue to divide as much as entice. The irony, of course, is in how telling a discourse this contention really is. The black and white, liberal vs. conservative debate has strayed from the hot button topics such as the death penalty or abortion and into support of one consumerist, unhealthy piece of merchandise or another. I know, I know, it’s actually about what these corporate giants stand for, but are we wasting our breath worrying about their opinions? Corporate influence has never been more pronounced, so perhaps not. I was sure that the usage of “Occupy Wall Street”-like production design would spark a tizzy. Instead, this commercial seemed to fly under the radar, though it does spell a subtle shift in tides for soft drink companies. In the commercial, young people (and this is the key) are seen wearing t-shirts that promote his or her “one of a kind” individuality. One shirt says, “I’m a dreamer,” as though linking the fight for civil rights to the mostly student loan debt induced Occupy movements. The playful protest posturing is a glaring metaphor for the global unrest we’ve seen in the past two years. While Dr. Pepper may be privately owned, it takes it’s lead from the likes of partial non-competitors such as PepsiCo and Coca-Cola. The latter may only trail Nike for name brand recognition in the way of corporate evilness. Coca-Cola is the most recognized brand in the world, therefore, the reach must not only appeal to Americans but to a growing global audience. Young people buy products, young people want to believe they are different, and young people are the most likely to denounce religion for more “practical” ways of living, so the newest ad from Dr. Pepper only makes sense within this marketing model. That soda companies have recognized the future will be filled with alienated and disillusioned people striving for a true purpose may just be another way to sell a product, or it might actually be as firm a stance as Chick-Fil-A. Coca-Cola’s CEO, Muhtar Kent, has faced concerns over soda’s effects on our health, with head-on veracity. Frankly, he thinks we are attacking “the man and not the issue.” And he may have a point. Either way, Kent wants to create a new legacy for Coke. One that doesn’t make a profit by pumping children full of processed sugar, but utilizes its power to make a difference in the world. Perhaps it’s a bit of noblesse oblige, but Coca-Cola has just taken its power into the efforts to achieve clean drinking water by teaming with world renowned inventor, Dean Kamen. In every village in the world, no matter how distant or impoverished, you will find two things: cigarettes and Coca-Cola. If their hearts are in the right place, the soft drink companies leadership may be the only people who can actually solve this thing. In all likelihood, these two Dr. Pepper ads are just brilliant marketing schemes concocted by well-paid professionals to seep into the skin of over-sexed, consumerist college kids. But perhaps there’s something more to this. If nothing else, Dr. Pepper has now taken a hard line in opposition to the contreversy stirred by Chick-Fil-A. Intentional? Not sure. An example of heavy corporate influence (one that says nothing about the products themselves, btw) in a world that is smaller than ever? Absolutely. This entry was posted in Coca-Cola, Commercials, Dr. Pepper, Marketing, Politics, Television and tagged Abortion, Branding, Brands, Chick-Fil-A, Christians, Coca-Cola, Commercials, Creationism, Death Penalty, Dr. Pepper, Evolution, Marketing, Muhtar Kent, Occupy Wall Street, Politics, television. Bookmark the permalink.